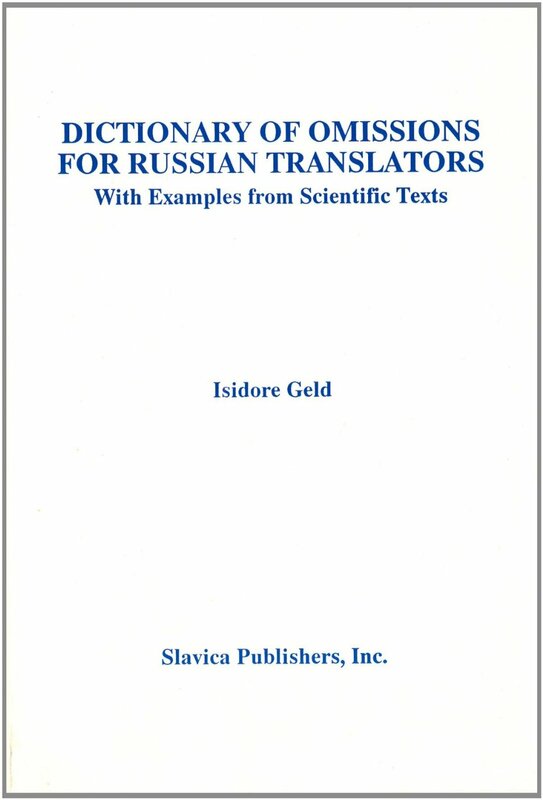 While the examples are taken from scientific texts, this dictionary will be of use to all students of Russian, and especially to all translators. "Omissions" are words or phrases that are not to be translated when turning a Russian text into English. Some examples are: dostatochno in "Ne predlozhen dostatochno ubeditel'noe ob''iasnenie" `A convincing explanation has not been offered'; nado skazat', chto in "Nado skazat', chto opisannyi metod iavlhetsia unikal'nym sposobom" `The method is unique'; davat' vozmozhnost' in "Sredstva, daiushchie vozmozhnost' izbezhat'..." `Methods of avoiding...' Knowing these phrases and techniques will greatly improve translations in any field, and will help students develop a better feeling for Russian style and a better understanding of Russian texts that they read. The book has short commentaries on general principles, and a bibliography, in the front and back of the book, but most of it is a listing, in alphabetical order, of items to be omitted, with at least one, and sometimes several examples for each item, and an English translation of each example. The head word or phrase to be omitted also has a literal English translation. Intermediate and advanced students of Russian will find this dictionary a great help in perfecting their knowledge of the language, as well as their ability to translate effectively into English.